Reasonable deal for the bad weather to come, wrap up and turn the heating down a couple of degrees, should pay for itself. 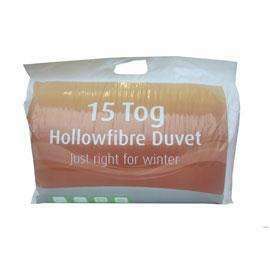 This Hollowfibre 15 tog Duvet is the perfect addition to your bedroom through the cold months. Easy to wash and extra warm, you will be sure to get a great night sleep, every night, this winter. Collect from store only, you may need to live near a Dunelm Mill site, sorry.